15% off for Fast Running Blog members at St. George Running Center! Best marathon: 2:23:57 (2007, St. George). 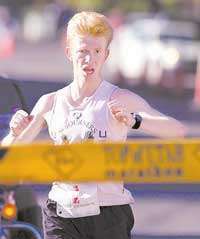 Won the Top of Utah Marathon twice (2003,2004). Won the USATF LDR circuit in Utah in 2006. Did not know this until June 2012, but it turned out that I've been running with spina bifida occulta in L-4 vertebra my entire life, which explains the odd looking form, struggles with the top end speed, and the poor running economy (cannot break 16:00 in 5 K without pushing the VO2 max past 75). Qualify for the US Olympic Trials. With the standard of 2:19 on courses with the elevation drop not exceeding 450 feet this is impossible unless I find an uncanny way to compensate for the L-4 defect with my muscles. But I believe in miracles. 2:08 in the marathon. Become a world-class marathoner. This is impossible unless I find a way to fill the hole in L-4 and make it act healthy either by growing the bone or by inserting something artificial that is as good as the bone without breaking anything important around it. Science does not know how to do that yet, so it will take a miracle. But I believe in miracles. I was born in 1973. Grew up in Moscow, Russia. Started running in 1984 and so far have never missed more than 3 consecutive days. Joined the LDS Church in 1992, and came to Provo, Utah in 1993 to attend BYU. Served an LDS mission from 1994-96 in Salt Lake City, Utah. Got married soon after I got back. My wife Sarah and I are parents of nine children: Benjamin, Jenny, Julia, Joseph, Jacob, William, Stephen, Matthew, Mary, and Bella. We home school our children. I am a software engineer/computer programmer/hacker whatever you want to call it, and I am currently working for RedX. Aside from the Fast Running Blog, I have another project to create a device that is a good friend for a fast runner. I called it Fast Running Friend. ...if we are to have faith like Enoch and Elijah we must believe what they believed, know what they knew, and live as they lived. Did a short tempo run - last workout before the half marathon. 2 miles down the canyon. Benjamin got 10:00 (5:03,4:57) - was feeling sluggish. I got 10:52 (5:19,5:33) - felt good in the first mile, then consciously backed off in the second. Total of 8 for me and Benjamin. Usual distances for everybody else. Did a 2 mile tempo run with Jacob down the canyon. Joseph's legs were not up to it again. Jacob did not do that well either - first mile was good - 5:53, but then he fell apart and ran 6:01. I think the problem was that we waited too long and Jacob's blood sugar was going down - he was hungry before the start of the run. Benjamin did 6, Joseph 2, usual distances otherwise. Warmup with Jacob and Joseph. 6.5 total for me. Tapering for the half marathon. Benjamin did 4. Usual distances for everybody else. Travelling to Indianapolis. Did some random running on the road. Monumental Half Marathon - 1:16:22 (chip time), 1:16:24 gun time, 60th overall, 3rd master ($50). Benjamin ran 1:09:34, 21st overall. I started out strong (5:35 pace for the first 3), but kept losing leg power as I went eventually slowing down to 6:05. I was able to squeeze out 5:52 mile at the end, but that was all I had. In spite of finishing 3rd master I hit a dubious PR for the chick score - 7. This is an odd race - strong open women field but relatively weak men masters. The overall winner (Pius Nyantika) ran 1:03:17. There were a lot of people between 1:07 and 1:10 range, and all the way down below. Even though I kept fading, I was never alone for too long - somebody would catch up and pull me at least for a little bit. Benjamin had a good race. He opened with 5:24, it felt hard, but he did not panic. He shifted gears, and averaged sub-5:20. His official 10 K split was 33:08 (mine 35:20). At 10 K he was in 28th place - he upgraded his position to 21st. Even though I faded a lot in the second half, I ended up losing only one place going from 59th to 60th. A couple of runners faded worse than I did, and a few more DNF'ed. Benjamin's split at 10 miles was 53:17, so his last a bit more than 5 K comes out to 16:17. I am very excited about that. Now I think the next thing we need to figure out is how to bring his 5 K under 15:00. His endurance could improve some, but if all he has got in a 5 K at sea level is 15:28, it would be tough to get anywhere near 1:05. My legs felt like they lacked the strength to keep the pace that felt natural for the cardio. They kept getting weaker and weaker as the race went along. I think the problem is that I have not trained them at that level of muscular exertion. I had the turnover from the downhill tempo runs, but as I learned today, when you go to sea level you need more than turnover to succeed. So my plan is to do shorter repeats alternating up an down, and try to hit target half race pace for the average of the repeats. I think Benjamin could benefit from that as well. Day of rest. Still in Indianapolis. Went to church there with Benjamin and my mom's friend Nina that we stayed with. Benjamin got a lot of Russian speaking practice with Nina. 7 on the trail in Indianapolis, 1 more in Las Vegas to the parking lot from the terminal. Usual day, usual distances for everybody. Usual day, 10.5 for me, usual distances for everybody else. Taper before the cross-country championship for the kids. Total of 10 for me and Benjamin. Benjamin and I ran 8 miles in the morning. We were going to take this as a fun race, but somehow both of us got good results. I ran 14 seconds faster than last year, Benjamin improved his time by 27 seconds in spite of being ahead by 59 seconds of the next competitor and running in Crocs (he could not find his racing flats) which makes things slower in cross country. For a comparison, Riley ran 16:15 last year, Jake 16:20. So maybe we should say this is at least 1 minute slower than Draper Days. If so, this would indicate a 5 K speed breakthrough for Benjamin that for some reason is not coming out in workouts. Almost makes me wonder if the course was short, but at the same time I felt my effort was cardio-taxed, I always had someone to run with, and generally felt I put in a solid quality effort. Benjamin also felt like his legs were working and his cardio as well unlike in his 15:56 Draper Days or 15:28 San Francisco track 5 K, so I am willing to believe he ran something that was in the 15:30 range quality in Draper Days and around 15:00-15:05 on the track. I was impressed with Jacob and Joseph's performances. They have struggled in workouts lately, so I was not expecting anything spectacular in the race. But they both ran PRs - Jacob improved by 8 seconds, and Joseph improved by 2 seconds. William and Stephen's race - ran around cheering. My own and Jenny's race. Day of rest, went to church. Joseph had a cold, did only 3 today. William hurt his foot and did not run. Otherwise usual distances for everybody. Benjamin and I did a workout today. 6x1 mile alternating up/down in the canyon with 0.25 mile recovery jog. The recovery between 3rd and 4th repeat was longer because both of us needed to visit the bathroom. My times were 5:56.3, 5:28.5, 6:11.2, 5:24.9, 6:08.9, 5:23.9. Benjamin got 5:35, 4:55, 5:31, 4:55, 5:31, 4:45. The purpose of the workout was to practice sea-level speeds on no-net-downhill terrain. Younger kids ran their usual distances except for William who hurt his foot and ran only 1 mile, and Joseph who ran only 3 recovering from the cold. Workout - 6x1 mile alternative up/down. Usual distances for everybody. Jacob did a 2 mile tempo run down the canyon. He struggled today for some reason. His first mile was decent - 5:55, but then he fell apart and ran 6:05. I think it is psychological - he is starting to be afraid of that course. We need to think of something different. Usual day, usual distances, except Matthew had a cough and did not run. Usual day, usual distances. Matthew had a cough and did not run. Did 16x0.25 in the canyon with Benjamin alternating up and down with 0.125 recovery. My ups were around 81, downs around 74-75. Benjamin was around 76 on the up and 67-68 on the down. On the last two Benjamin did 61 down and 66 up. I only pushed the last up - 77. Then I also did 3x1000 with 400 recovery with Joseph and Jacob. William did 3x400 trying to keep up with us, but he succeeded only on the second interval. Jacob got 3:40,3:38,3:35. Joseph - 3:39, 3:36, 3:33. Stephen ran a bit more than 2 miles total with 400 on the track in 1:37.6 - new PR. Other kids ran their usual distances. Cool-down with Benjamin, Jenny joined us for the last 2.5. To the track with the gang of little boys. Workout with Joseph and Jacob (William running 400s). With Stephen, Joseph, and Jacob - Stephen's PR. Back to the house with the gang. Day of rest. Went to church. Usual day. I think it might be time to start taking Mary on regular runs. I had to get to a work meeting, so I ran 10 alone. Kids ran their usual distances, except I had Benjamin run only 6 as he felt he might be getting an injury. 8 total, a little rest before the Earn Your Turkey 4 mile race. Kids ran reduced distances - 2 for Joseph and Jacob, 1 for William. Stephen and Matthew ran regular distances. 2 for Julia, 3 for Jenny. Mary did 2x100. Benjamin did 6. With William, Benjamin, and Stephen. Earn Your Turkey "4" miler (really 3.95), official chip time 22:48, official gun time completely wrong , on my watch 22:49.9, 8th overall, 3rd master, but got my turkey because Scott Keate (20:06, 1st) and Matt Poulsen (21:08, 4th) made top 5. I did not get beat by anybody older than me, but I was close - I only passed Dave Taylor at around 2.6 mark and did not gap him by much - he ran 22:55. I also did not get chicked, although that appeared to be in question because Heidi Sumsion was with me at 1 mile and looked strong. She ended up with 23:25. The temperature was 28 F for the adult race, and got maybe to 30 F for the kids races. So we wore long pants, which made things slower. But fortunately no major wind, so the times were not too slow. Overall we set our turkey record today earning 10 - 2 from overall placings, 7 from age division wins, and 1 from the largest immediate family award (11 people in the race, everybody except Bella ran). Sarah ran 37:01 finishing 4th in the 40-44 age division. This is a very good result for her. She has never been this fast before with a 7 week old baby. Benjamin got second place with 20:14. He and Scott broke away from Matt Poulsen and Nate Hornok after about the first mile, and fought it out until 3.5. Then Scott made a move that Benjamin could not match and ended up 8 seconds ahead. Jenny scored her first podium finish in this race with 26:33 (5th place overall). This converts to 20:37 5 K (using Runworks Calculator), so she is getting closer to qualifying for a driver's license (her standard is 20:00 5 K on a certified non-aided course). Julia won the 12-14 age division with 28:56. Joseph won the 11-12 age division mile with 5:34 officially, 5:33 on Benjamin's watch. Jacob won the 9-10 age division mile with 5:49 officially, 5:48.8 on my watch. Joseph did not take the lead until 300 meters into the race, Jacob did not pass the second place in the 11-12 age division until about 500, but in the end Joseph was 50 seconds ahead, and Jacob 35 seconds. I was not expecting that - I thought maybe Jacob would be 15-20 seconds ahead or so as that kid was quite strong in the opening quarter. Joseph's last 400 was around 80 seconds, Jacob's 85. Benjamin was the rabbit in the mile, I ran with Jacob. I was pleased to see that Joseph had good judgement and paced himself correctly even though he had no pacing guide for the first 300 meters. William won the 7-8 age division 800 in 3:04, new PR. He opened with 87, then closed in 97. I would have been happier if the closing 97 was 93 or faster, but still this is a lot of progress for William. Stephen had a breakthrough race. He finally capitalized on his 400 speed and was able to use in the 800. He ran 3:29 winning the 5-6 age division. In fact, he finished 3rd in the entire heat, only 2 seconds back from the second place in the 7-8 age division. His splits were also respectable - 46, 51, 54, 54 - considering that he ran a 200 PR, then repeated a 400 PR, and then still ran the pace faster than his earlier 800 PR from 400 to the finish. He is finally beginning to develop some mental toughness. We should not that in our family he has a reputation for being a couch potato - he can eat an infinite amount of snacks finding the in the strangest places and watch an infinite amount of movies. Matthew won the 3-4 age division 400 meter run in 2:09. Jenny held his hand. He stopped after the first 200 being confused and scared of the road - thinking the cars were going to drive on it and get him, a bunch of kids passed him, but then Jenny talked some reason into him and he got going, passed them all, and won the race. Mary took 2nd place in the 100 meter 0-2 age division race with 1:01. She was the only kid from our family that did not win a turkey. We have not yet trained her on a regular basis. Part of the problem was that she did not quite understand it was a race - a common problem in that age division. Ran back to Sarah and finished with her. With Benjamin - his hip adductor was hurting, so we ran 9:00 pace. Usual runs with some exceptions. Benjamin did only 6 as his muscles were tight and sore from the race. Matthew did 400 on the track. Jacob added 100 (15.5) + 200 (33.3) on the track. William did 18.6 100 in addition to his regular run. Stephen added 21.4 100. With Joseph. His legs were hurting. With Matthew on the track. Did a workout with Benjamin. 3 miles down the canyon alternating tempo 0.75 with hard 0.25. Total time was 16:44 (4:23, 77.8, 4:15, 76.4, 4:19, 72.3). Benjamin had some muscle tightness, so we stopped for him to stretch after the first mile. I was happy to be able to kick in 72. Then I went to the track with Joseph, Jacob, and Julia. Jacob had sore hamstrings, so he just jogged. Joseph ran a PR in 400 - 70.6 (with me pacing), then served as a rabbit for Julia running 100 in 15.9 and 200 in 34.7. Julia got 17.6 in 100 and then did 2x200 in 37.2, 37.3. I ran 100 and the first 200 with Joseph, and then paced Julia in the last 200. Joseph did a total of 4, otherwise the kids ran their usual distances. Fartlek with Benjamin down the canyon. Back to the house with Benjamin. With Joseph, Jacob, and Julia to the track. 100 with Joseph and Julia. 200 with Joseph and Julia. Joseph did 1, Julia 2.5. Day of rest - went to church. Snowy day, slow times. ATV still not road ready, so did not plow. Benjamin had a cold, ran only 6 miles. Otherwise usual distances for everybody. Had an adventure in the evening. We went with our kids to their choir concert in Draper. There was a blizzard. Our van had trouble making it up the hill by the Pointe of the Mountain near Thanksgiving Point - it was very slippery. We slid to the side of the road and could not move forward. One man stopped by and tried to tow us but his tow chain broke. We called the tow truck - the operator told us we would have to get out of the van and find our way to safety on our own if he came. With 11 people, including 3 children under 5 not a good idea. We called highway patrol, but they were swamped. In the meantime, a semi started to try to get around us. It was rather concerning as the tractor had to face sideways as it moved forward to keep the trailer from sliding into us. So all we could do was pray and trust in the experience of the trucker. I figured if he made it that far in his job, he probably knew what he was doing. It all turned out good - the trailer stayed parallel to our van the entire time. Finally after waiting 40 minutes or so we decided to give it another shot - by that time the quality of the snow has changed and we had enough traction to get out. Part alone, part with William and Julia. Usual distances for everybody, except Benjamin did only 6 - still has a cold + finals. With Jacob and Jenny for the first 2 miles, the rest alone. Ran with the kids, then did 4x0.156 on the hill over by the house. Wheeled it afterwards - the distance came out to be 827 feet, so 50 seconds for 5:20 pace, 46.9 for 5:00. The grade varies between 3 and 6 %. Kids ran their usual distances, except Benjamin did 4 (cold, finals), and Jenny also did 4.5 as she is starting to catch a cold as well. With Jacob. Jenny ran most of the way with us, but fell back in the last half mile. With Sarah. Probably a PR for the 8 week old baby.